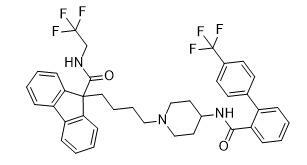 Remarks:Lomitapide is also know as AEGR 733; AEGR733; AEGR-733; BMS 201038; BMS-201038; BMS201038; BMS 201038-01,is a MTP inhibitor. Lomitapid is a novel agent for the treatment of homozygous familial hypercholesterolemia. Lomitapide is an orally active inhibitor of microsomal triglyceride transfer protein that is indicated as an adjunct to a low-fat diet and other lipid-lowering treatments, including LDL apheresis where available for the reduction of LDL-C, total cholesterol, apolipoprotein B, and non-high-density lipoprotein cholesterol in adult patients with HoFH.